Dr. Seuss' Birthday/Read Across America. Costumes and Accessories. Cat in the Hat, Thing 1 and Thing 2 for sale and rent for kids and adults for the annual celebration of reading, “Read Across America” on Dr. Seuss’ Birthday. Read Across America is a national day celebrating reading. The idea w as first created in May 1997 as a way to get children excited about reading. It was then decided to celebrate it on Dr. Seuss’s Birthday. So on March 2nd, 1998 the largest celebration of reading began. By celebrating Dr. Seuss, the most beloved children’s author, sends a message to children that readings is important and fun. Read Across America is now celebrated annually on Dr. Seuss’s birthday, March 2nd. Dr. Seuss has delighted generations of children, while encouraging them to read. 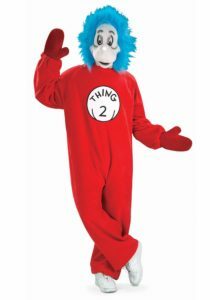 Bring your favorite Dr. Seuss characters to life. 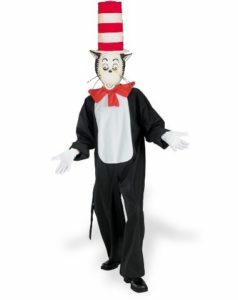 Whether you’re looking for a Cat in the Hat costume, Thing 1 costume, Thing 2 costume or The Grinch costume, we’re sure that you’ll find it here; as well as all the great accessories, like hats, gloves, bow ties and accessory kits for both kids and adults. Theodor Seuss Geisel is better known to the world as the beloved Dr. Seuss. Dr. Seuss has captivated over four generations of children and parents alike, all in the while helping millions of children learn to read. Dr. Seuss wrote and illustrated 44 books, which have been translated into 20 different languages making him the best –selling children’s author of all times. 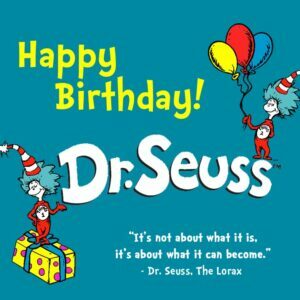 Today, his books and characters remain to be very influential in young children’s lives. Theodore Seuss Geisel was born on Howard Street in Springfield, Massachusetts on March 2, 1904. As a teenager, Theodore left Springfield to attend Dartmouth College. While at Dartmouth, he became the editor-in-chief of the Jack-O-Lantern, which was Dartmouth’s humor magazine. After Geisel was caught throwing a drinking party which violated Prohibition laws, the school made him resign from all extracurricular activities. He continued to work on the Jack-O-Lantern without the schools knowledge by signing his work with the pseudonym “Seuss”. After graduating from Dartmouth in 1925, he went onto Oxford University with the intention of acquiring a doctorate in literature. While attending Oxford he met his first wife, Helen Palmer, whom he wed in 1927. After returning back to the United States, Geisel began publishing cartoons and humorous articles in major magazines such as Judge, Vanity, Fair and Liberty; however most of his work during his early career was to create advertising campaigns for Standard Oil. After a while, Geisel began to grow frustrated in the advertising world and in his spare time he began writing and illustrating an alphabet book for children. It was an exciting project for Geisel but after several publishers turned him down he was discouraged from writing for years. While on a vacation cruise in 1936, he conceived the idea for his first children’s book. Written and illustrated by Dr. Seuss, And to Think That I Saw It on Mulberry Street was finally published in 1937, but not after being rejected by more than 20 different publishers. During World War II, Geisel joined the Army serving with Frank Capra’s Signal Corps Unit making training movies. During this time he was introduced to the art of animation and created a cartoon called “Gerald McBoing-Boing” which won him an Oscar. The most significant book of Dr. Seuss’s career was The Cat in the Hat, which began as a result of a Life article that was ran in 1954 that criticized children’s reading levels. The article reported that children were having trouble learning to read because their books were boring. Publishers Houghton Mifflin and Random House teamed up on a unique adventure asking Geisel to write and illustrate a book that children would find interesting while only using a list of 200 words that children should be learning in school. It took Dr. Seuss nine months to complete due to the difficulty of only using the selected words but with the release of The Cat in the Hat began the beginning of the Beginner Books. Helen Palmer Geisel died in 1967. The following year, Geisel married an old friend, Audrey Stone Dimond. Ted Geisel continued writing and illustrating books that told whimsical and zany tales using monosyllabic words that readers could comprehend. His use of patterned and rhyming text became the foundation for many young readers. Ted Geisel died on September 24, 1991. Even after the death of Dr. Seuss, his work still inspires children to explore the joys of reading. 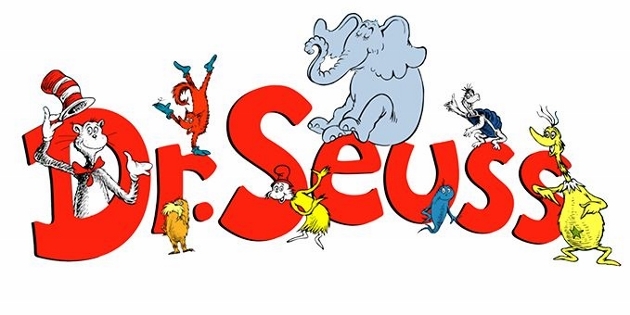 Some of Dr. Seuss’s most popular books include One Fish, Two Fish, Red Fish, Blue Fish (1960), The Cat in the Hat (1957), Green Eggs and Ham (1960) and How the Grinch Stole Christmas (1957). There have been a number of animated films made based of off his books such as How the Grinch Stole Christmas in 2000, The Cat in the Hat in 2003 and most recently Horton Hears a Who in 2008.